Have you hugged a farmer lately? Giving thanks to the hardworking people who feed us! Thanksgiving is just a few days away and like many people, I am eagerly anticipating having family and friends gather from far and wide to share a delicious feast in my home. I’ve planned my menu and this year, more than ever, I’m focusing on making farm-fresh vegetables shine. It’s going to be one heck of a meal. 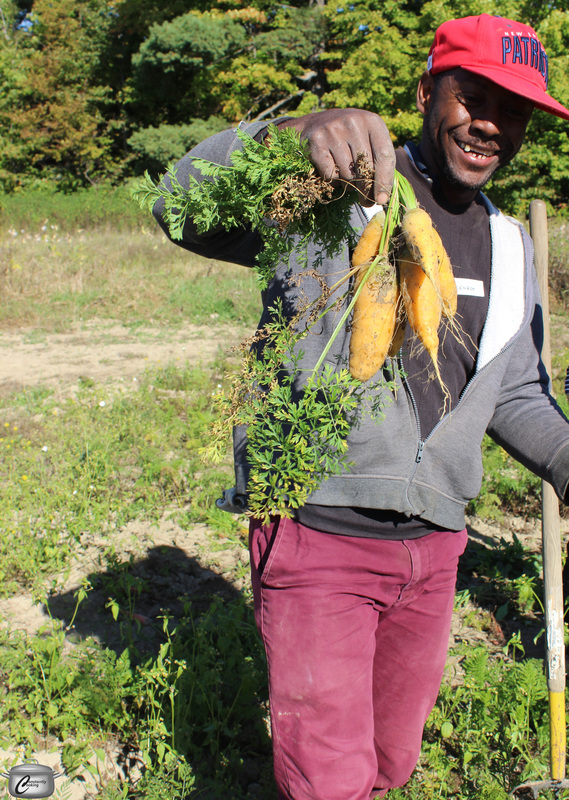 Yesterday, I was reminded how fortunate we are in the Ottawa area to have a wealth of talented, hardworking farmers, without whom our meals would be less flavourful and nutritious. 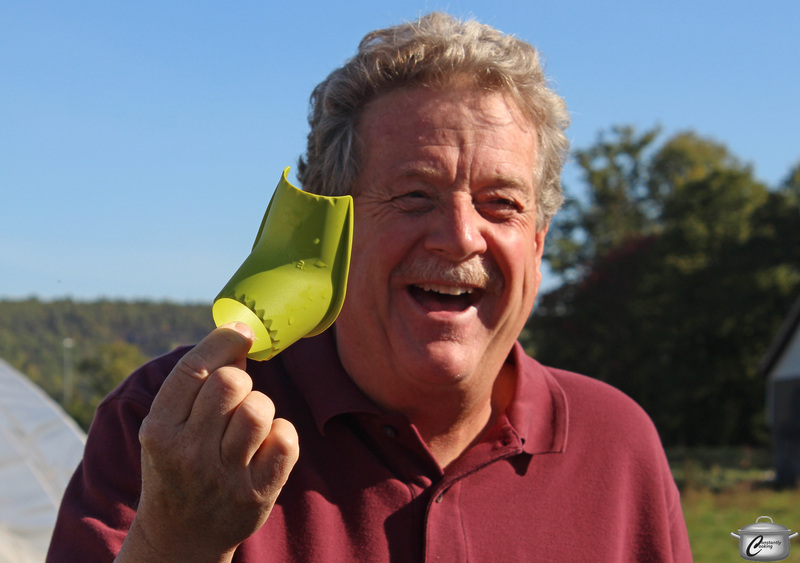 Terry Stewart is the hardworking co-owner of Bryson Farms in Quebec’s Pontiac region. 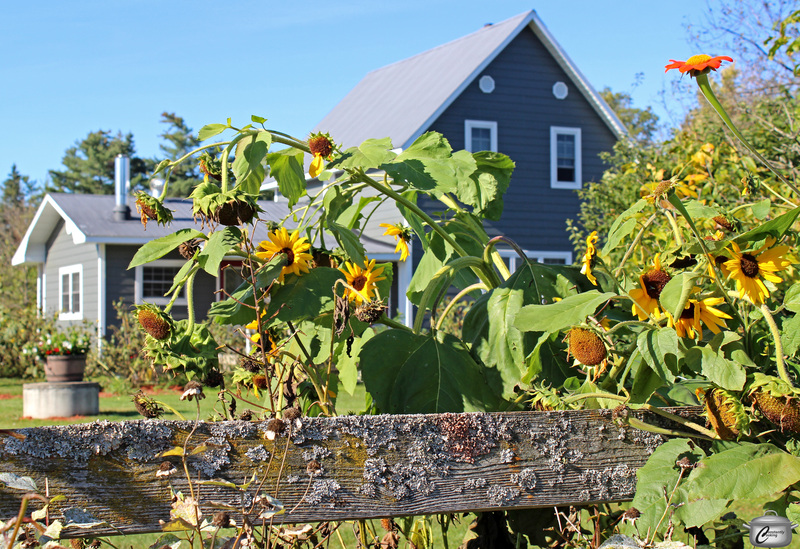 A recent trip to Bryson Farms in the Pontiac region of Quebec, just over an hour’s drive from Ottawa, reinforced how much I appreciate people like Terry Stewart and Stuart Collins, who have been lovingly tending their organic farm (and sharing the results) for two decades; the farm has actually been in Terry’s family for over 100 years. A mainstay at the Ottawa Farmers’ Market, Bryson Farms serves up fresh produce and beef, as well as delicious prepared organic foods crafted in-house at their busy farm by talented chef Richard Nigro and flash-frozen on site for maximum flavour and freshness. This year, they’ve also added in cooking classes and I cannot recommend this experience highly enough. 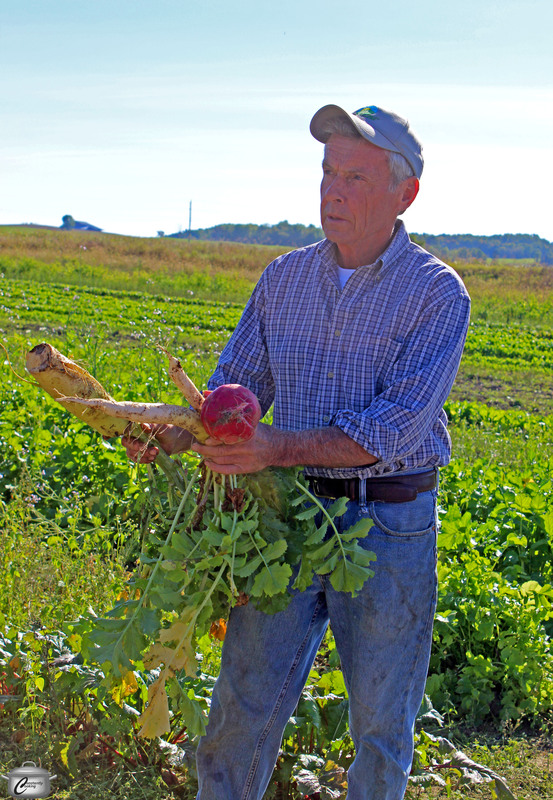 Our day began with a tour of some of the farm’s 700 acres, about 80 of which were cultivated this year. That may not sound like much compared to the scale of some conventional cash crop farms, but for an organic farm, where almost all the labour is done by hand, it’s huge. Stuart and Terry proudly showed off their efficient operation and it was a pleasure to talk with their seasonal farm hands, many of whom hail from Mexico and Jamaica. These skilled labourers who return year after year to Bryson Farms were as passionate and knowledgeable about organic farming practices as the farm owners themselves and took great pride in showing the results of their efforts after a season which got off to a very challenging start due to intense spring flooding in the region. 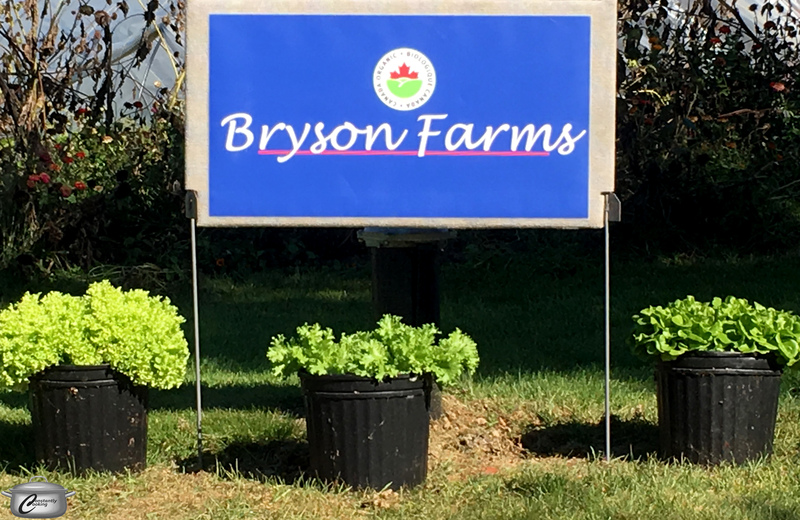 Bryson Farms grows a great diversity of crops including many varieties of colourful carrots and beets but one of the most fascinating things (to me) was their lettuce growing operation. Bryson’s bagged lettuce mixes sell like hotcakes at the market and are a favourite item among their home delivery customers as well. 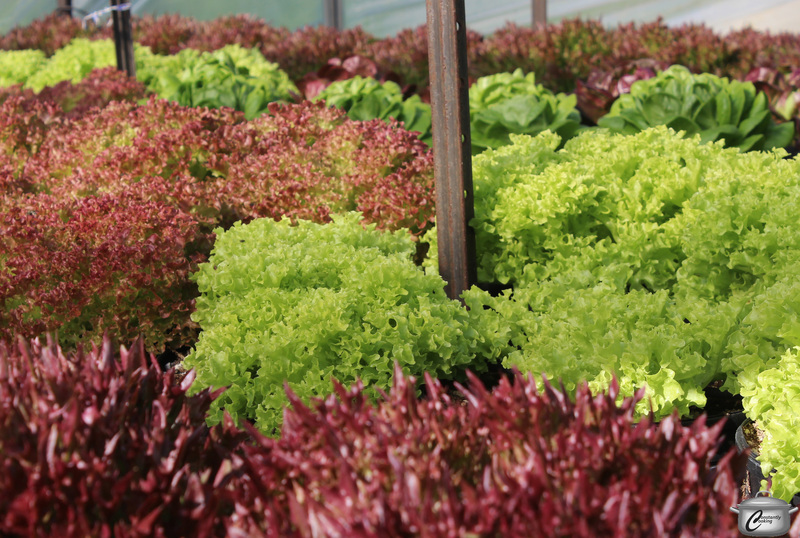 They purchase only one brand of lettuce seed called Salanova which comes in eight varieties including green and red butter, oak leaf and crisp lettuces. What makes these lettuces especially unique, aside from the fact that the plants are extremely high-yielding and the leaves have an exceptional shelf life, is the ease with which they can be processed. Stuart explained how it used to take them many hours to pick 30 pounds of lettuce leaves; now, with Salanova’s unique lettuce cutting tool, they can now harvest the same amount in just 20 minutes, after which the leaves are washed, spun, dried, bagged and ready to deliver. The farm tour was absolutely fascinating, so much so that I almost forgot there was more on the agenda. A thoroughly enjoyable ‘Thanksgiving Outside the Box’ cooking class led by Chef Bruce Wood was a real delight. 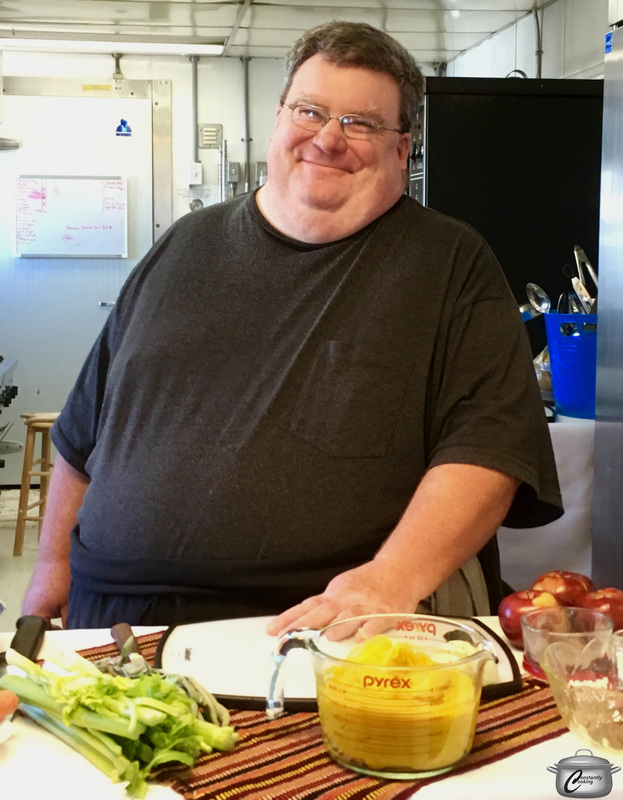 Chef Bruce Wood in the Bryson Farms production and teaching kitchen. Bruce is a great teacher and offered up a wealth of information and useful tips. For example: the real reason chefs sprinkle seasonings from a great height is not because it looks impressive; it actually helps distribute the seasonings more evenly throughout the dish. He also encouraged us to think about ‘cooking backwards’, which means shopping at trusted purveyors of quality meat, fish, cheese and produce and letting what you’ve gathered determine what you prepare. 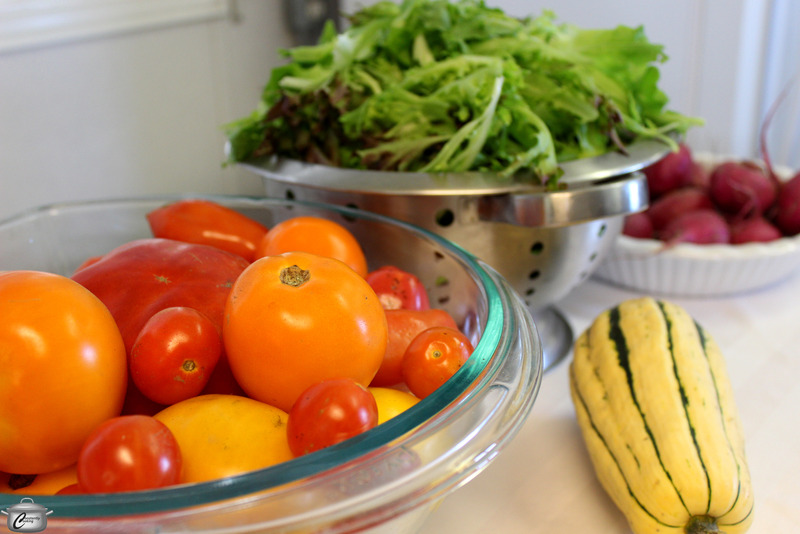 Of course, working with just-picked produce is any cook’s dream come true! Bruce’s menu included an impressive array of flavourful dishes including a sweet onion Tarte Tatin, maple-roasted root vegetables with a cheddar-oatmeal crumble, honey-butter glazed Brussels sprouts, cider-brined roast turkey with apple hazelnut cornbread stuffing and a heavenly cardamom-ginger squash pie. After watching him prepare this feast with the cheerful help of several kitchen assistants, we got to dine under a tent in the farmhouse yard, savouring both the food and our surroundings. 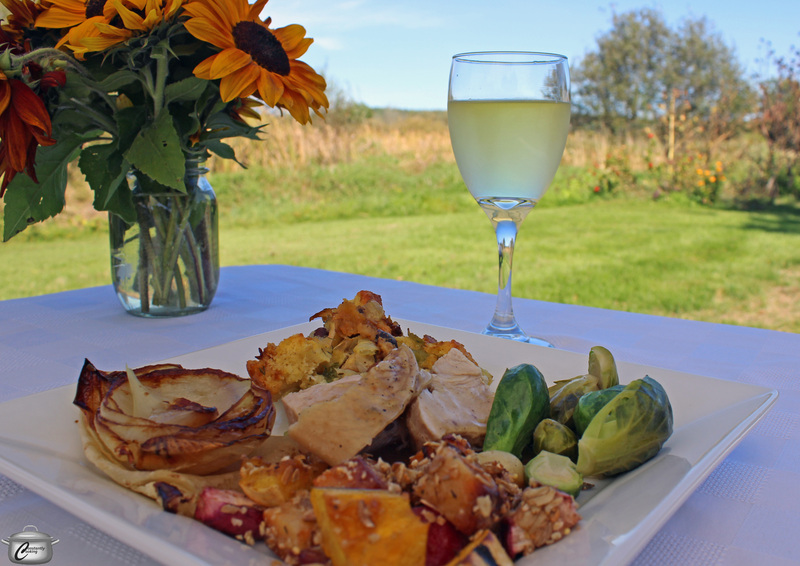 Chef Bruce Wood’s delectable lunch was even tastier when enjoyed outdoors on the farm! Stuart assures me there will be more cooking classes at the farm next year. Make time to do this – you’ll be so glad you did. In the meantime, if you’ve hugged a farmer and purchased some of his or her produce, I have a whole lot of Farmers’ Market inspired recipes that you might want to take a look at. Disclosure: I was a guest of Bryson Farms’ for this lovely day but, as always, all opinions are my own. This entry was posted in cooking classes, Events. Bookmark the permalink.